Continued innovation in the flexible packaging industry globally is all due to keeping it real locally with a loyal employee base. Caption: The Tempo Plastics Limited owners (from left, back row): vice-president of human resources/logistics Richard Hardwick; president Michael Mencarelli; vice-president of production Michael Bannon; (front row) vice-president of marketing Leonardo Giglio; and vice-president of quality assurance Lee-Anne Giglio. For a company that proudly touts 45 years of quality, reliability, award-winning printing in the flexible plastics industry, what it was most proud of was it long-term relationships with both its customers and its employees. Tempo Plastics Limited situated in Innisfil, approximately one hour’s drive north of Toronto is that company. Opening its doors in 1969, Tempo started out as a distributor purchasing and selling PE (polyethylene) plastic bags. The very next year, the company got involved in converting poly bags, and began to extrude poly- ethylene film in 1973, and by 1976 had purchased its first printing press capable of printing six colors, quickly becoming vertically integrated under one strategic roof. “Actually, our Innisfil building is something we purchased and moved into in 1984, and recently had renovated, increasing our facility footprint in 2008 to 100,000 square feet, acting as the foundation and implementation for HACCP (Hazard Analysis Critical Control Points) food safety programs,” Tempo Plastics vice-president of marketing and co-owner Leonardo Giglio told Canadian Packaging magazine during a recent visit to busy, but extremely tidy facility. 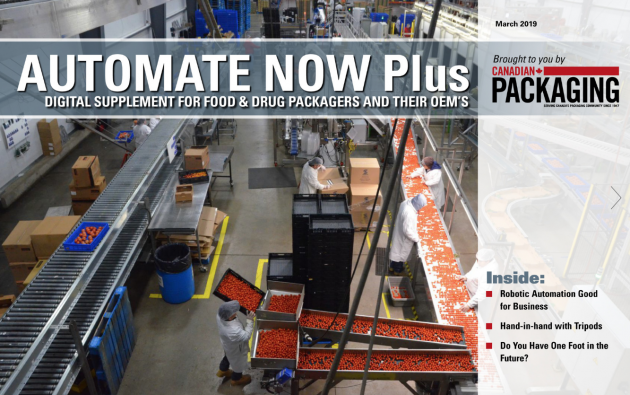 Nowadays, Tempo specializes in custom-printed flexible packaging—award-winning flexible packaging with incredible print quality—and supplied directly to manufacturers, food processors and advertisers. The award-winning line-up of Tempo Plastics pouches (from left): Duo Pouch, TimeFresh, The Edge, and the #4. He adds that even the company’s processes—from quotation to invoicing—are fully computerized, meaning all documents and product requirements are accurate and well-maintained. “We are also an ISO 2008-certified facility with full GFSI PAC Secure,” notes Giglio. IFS PACsecure is a certification standard for primary and secondary packaging materials, is now officially benchmarked to the Global Food Safety Initiative (GFSI). The standard, a collaboration between IFS Management and PAC, Packaging Consortium, is designed to provide high level safety and quality certification for food packaging material converters. 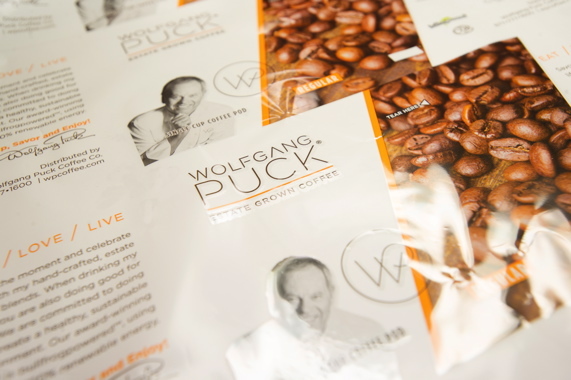 A close-up of some of the packaging created by Tempo Plastics showcasing the Wolfgang Puck Estate Grown Coffee brand in coffee pod format with the contents and the package being 100 percent compostable. Giglio’s father, Joseph, and his partner John Paterson had been working in the bag converting business in Toronto when they saw an opportunity to start their own company. Together, in their early 20s, they founded Tempo Plastics and paced themselves for slow and steady growth built on solid relationships with customers, suppliers and employees with the goal to always maintain long-term success. Originally in Mississauga, they moved the business lock, stock and barrel to Innisfil, just off Highway 400 back in the 1980s, at a time when Giglio says there was practically nothing else in the area—not even a coffee shop. 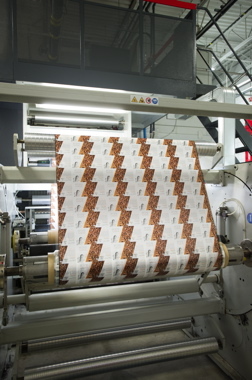 Rewind of Flexotecnica running a intricate design for the single-serve coffee market. “We were just 60,000 square feet at that time,” notes Giglio, “but I think what is very much telling about Tempo Plastics is that we still have employees who worked in that Mississauga site still working with us now. Giglio says that Tempo Plastics has always made the workplace a comfortable work environment with a team atmosphere that encourages employees to provide feedback to improve processes to make the workplace and production efficiencies even better. Tempo Plastics press operator Jason Stanutz compares past orders to current order with director Richard Hardwick to ensure there is no variance in print quality. Recognizing that Tempo’s success has been due to the hard work of it employees, in 2013 it created the ‘Builders of Tempo Plastics’ wall of fame in a boardroom, featuring framed photographs of all the employees who have worked 30 years or more with the company. Giglio, as mentioned is a co-owner of Tempo Plastics, along with his sister and vice-president of quality assurance Lee-Anne, and industry veterans: vice-president of human resources/logistics Richard Hardwick; vice-president of production Michael Bannon; and company president Michael Mencarelli, all of whom have been with the company for a long time, and all have their place on the company wall of fame. Since joining Tempo in 1979, Hardwick has been applying methodical approach to achieving the quality objectives set forth by the company directors. His printing background and holistic understanding of packaging has helped the company grow by having it obtain such certifications as ISO 9001:2008, HACCP, and most currently IFS PACsecure. During his 38 years with Tempo, Bannon has spearheaded key machinery acquisitions and implementing a fine-tuned manufacturing but, says Giglio, he will be retiring at the end of this year. “While it will be extremely difficult to lose a person like Michael, he has been working closely with the Tempo department heads to ensure the team has all the right tools to continue on the path to growth and development. Mencarelli is not only the company leader since 2012, but also leads as Tempo Plastics’ longest-standing employee, with 40 years of experience. Initially working as a salesman and then as vice-president of sales, “Mencarelli still keeps his hands in the sales segment, maintaining some of his original customers the same way he treats his own family,” notes Giglio, adding that as company president Mencarelli’s role is to also focus on long term growth, and guiding the team and next generation into the next phase with more complex and innovative product offerings and maintaining industry leading customer service standards. 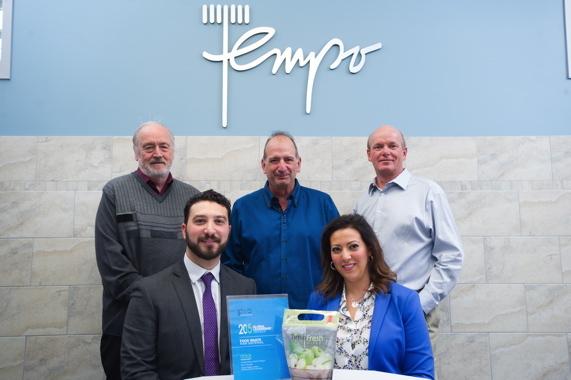 “Another long term employee with Tempo is Joseph Montalbano, who has worked with Tempo for 35 years in the sales department, and has transitioned into the senior business development manager,” explains Giglio. “He maintains a long history of servicing the produce industry, one of Tempo’s core customer bases, and continues to use his expertise and stellar reputation to increase market share with TimeFresh, our shelflife extension line. Giglio says that when Tempo Plastics added an additional 40,000 square feet in 2008, it was actually customer-driven. Customer service and employee loyalty aside, Tempo Plastics is well-respected in the packaging industry for its high quality products that enable brands to really ‘pop’ on the retail shelves. Citing an opportunity to reduce food waste, Tempo Plastics created the TimeFresh stand-up bag for the freshcut and whole foods markets to maximize freshness and shelflife. Giglio notes that key elements required for pack- aging design involve product functionality, consumer convenience and product security. “But we also look at providing a design that will appeal across multiple consumer demographics for higher market success, practical implementation throughout the entire packaging and marketing process and, of course, sustainability in an effort to reduce environmental impact,” he explains. Citing the light-weighting aspects of plastic bags over other package types, Giglio is very proud of the efforts Tempo Plastics has put forth, especially recently with the advent of multiple formats of plastic bags it has introduced: TimeFresh, The Edge, Air, Duo Pouch, and the simply-named #4. The company manufactures monolayer polyethylene (PE) and polypropylene (PP) bags and rollstock: gusseted and non-gusseted sideweld, bottomseal, wicketed, back seam, U-film, J-film and sheeting; as well as multilayer laminated pouches and rollstock: stand-up pouches, bottom seal, three-sided, backseam, and wicked with optional zipper closure. “We now see laminates as our key growth area, via stand-up multi-layer pouches and rollstock,” Giglio relates. Tempo Plastics press assistant Veron Merriott cleaning printing plates after a press run. 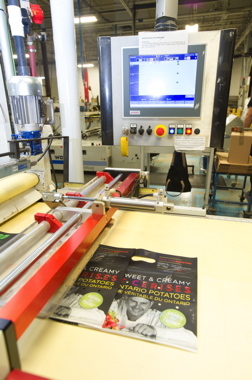 One of those keen innovations is its TimeFresh technology, a stand-up pouch that is a keen mover and shaker for customers in the produce industry. The TimeFresh packaging concept has been designed by Tempo Plastics for the freshcut and whole foods markets to maximize freshness and shelflife. Giglio says that invisible laser perforations in the bag help protect the package’s integrity and limit the risk of contamination for superb consumer safety, which in turn also helps protect customer brands. Depending on a customer’s product needs, two additional attributes can be added into the packaging: ethylene gas absorption and anti-fog functionality. decay and therefore increasing product shelf-life,” explains Giglio. Improved customer profits with decreased shrinkage and spoilage. 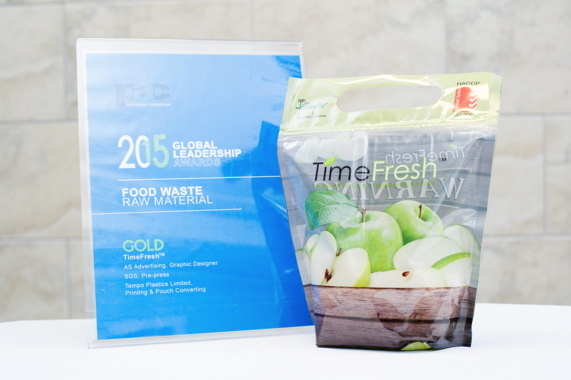 Not only have customers and consumers found the TimeFresh pack to be a boon with some 21-days of shelf-life offered, but it also took home the 2015 PAC Global Leadership Award Gold winner in the Food Waste Raw Material category. Fresh from a pouch making machine, this Tempo Plastic high-definition 3D pouch with a carry-handle is printed with both matte and gloss ink applications. For the past three years, Tempo has joined forces with the graphic design department of Georgian College in Barrie, Ont. Giglio says that Tempo Plastics also hosts a design competition for the students that corresponds with whatever new project Tempo is always coming up with. The students are given a dieline and a set of criteria, and then they apply their creativity to showcase our printing capabilities and pouch technologies. Two of those student success stories have involved The Edge and Duo Pouch, with next years competition to surround Tempo Plastics’ brand new Select Met and Sure Tear technologies—both of which have not yet been revealed to the general public at the time of this publication. 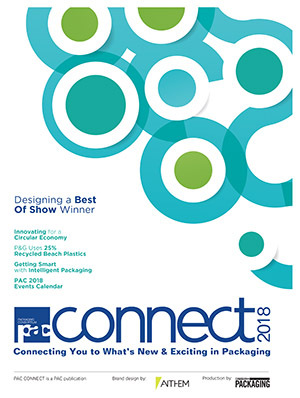 Along with being used in the Georgian College design competition, The Edge is a 2015 PAC Flexible Packaging Silver Award winner. The flexible, stand-up pouch is customizable, environmentally-friendly, cost–effective, comes with full-bleed graphics that cover the entire pack right to the edge, and comes with extended shelf-life capabilities. “It’s actually very cost-competitive to its more rigid counterparts, but the excellent graphic capabilities it possesses are off the charts,” mentions Giglio. Available in a wide range of sizes and resealable zippers, Giglio says the unique Edge pouch’s ability to offer a full-bleeding rotogravure-style look without the cost has been garnering inquiries from many customers interested in using it for liquids and dry goods. According to Tempo, the Duo Pouch offers cross-promotional possibilities, is each bag actually contains two separate pouches, which means different products—such as dry and liquid—could be placed in each. “We can customize the bag into a vast array of sizes and configurations,” Giglio enthuses, adding that with the inclusion of a resealable zipper and self-supporting gusset, the Duo Pouch easily showcases multiple product lines in one convenient package, perfect for lawn and garden, coffee, health and wellness, pet food products, and club store formats. Sustainability and how packaging pertains to the environment is also a top focus at Tempo Plastics, which was why it devised the #4 pouch, that like its moniker suggests, can safely enter the #4 recycling stream. “It still offers a rigidity like other laminated pouches, plus we can add the typical pouch features such as durable flange style press to close zippers, as well as different types of hanger or handle options,” notes Giglio. Made of LDPE (Low-Density Polyethylene), Tempo Plastics calls the #4 more Bluebox-friendly—a key concern for consumers and municipalities with issues surrounding landfill. LDPE is considered less toxic than other plastics, and very much safe for human use, but while it is not commonly recycled, it is recyclable with more communities creating recycling programs able to handle this material. 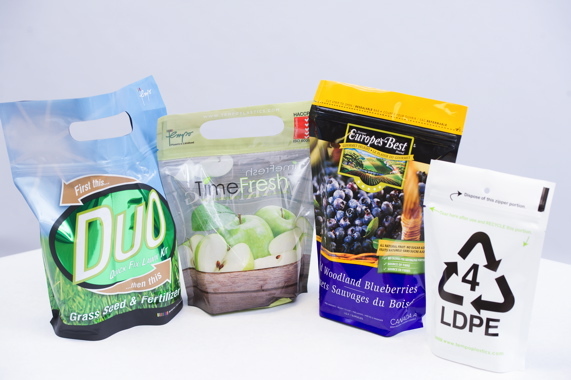 “Our #4 pouch exceeds market criteria for performance and cost by being more durable than standard LDPE film, and is less expensive than traditional laminated pouches one usually sees in the marketplace,” adds Giglio, noting that the #4 pouch is geared towards customers looking to brand frozen produce, confection, pet treats, or lawn and garden products. The Air pouch comes with a one-way degassing valve that Giglio says was designed with the coffee industry in mind, but could also be used for medical packaging, health and wellness, as well as lawn and garden. These flexible one-way valve is applied in-line, providing a degassing rate equal to anything else on the market, though Giglio says Tempo Plastics can offer it all at a more competitive price. Tempo Plastics pouch operator Mona Russell testing stand-up pouches for leaks—randomly plucked from the production line. If no bubbles are present in the tank, the pouches pass the quality assurance check. He does say that what gives Tempo an edge is that any package using the technology also gets to use the company’s award-winning printing capabilities to enable it to better stand-out on the retailer shelf. While reluctant to reveal the finer details of the company’s range of equipment used to create its diverse line-up of flexible packaging, the folks at Tempo did discuss that when it comes to equipment, it not only has to be able to help create the high-quality products they want to create, but it has to do so in a manner that makes the job less stressful for its employees. One of those pieces of equipment is its Press 11, an eight-color press manufactured by KBA-Flexotecnica, and Italian-based company specializing in the manufacture of printing and converting machines for flexible and rigid packaging, that was acquired and integrated into the KBA Group. Installed in 2013, Giglio says adding the Flexotecnica press was a no-brainer owing to the long and great history Tempo has had with them. 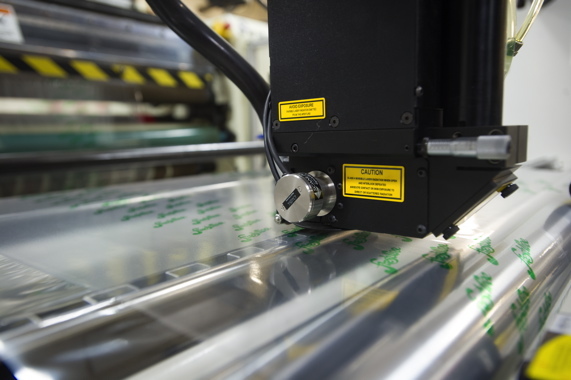 Other great pieces that help Tempo output its innovative flexible packaging are a Deacro slitter and a Preco laser that is used to provide those invisible perforations in the film that aid in product shelflife considerations. 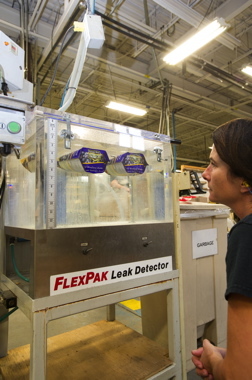 For quality control, Tempo uses a FlexPak leak detection system manufactured by Flex Essentials that can provide multiple formats of testing to help ensure packs are not compromised in any way, to ensure product integrity and customer safety. Being in business for 45 years, Giglio admits that Tempo has seen many peaks and valleys—just like every manufacturing company has—but it has always continued to grow. 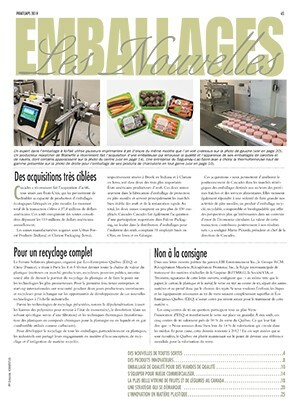 For Tempo, the manner in which it goes about its daily business has not only helped create a loyal and growing customer base, it has also created employee stability, with Giglio citing that approximately one-third of all the current employees have been with Tempo Plastics for over 20 years. “We certainly appreciate our workers, and every year we recognize ‘years of service’ and mark the occasion with five-, 10- and 15-year celebratory pins,” says Giglio. Tempo doesn’t just spout company rhetoric with regards to team-building—it lives it, with bi-monthly employee appreciation events both on- and off-site, with festivities that also includes employee families. A Preco laser adding the virtually invisible laser perforations to a controlled atmosphere film to helps provided extended shelf life to packaged products thereby reducing food waste. For Tempo Plastics, Giglio acknowledges that its growth will revolve on ways to help reduce food waste, aided by the PAC Food Waste global initiative. Giglio explains that some 30 percent of all the fresh produce purchased for the home end up in the garbage, and is why Tempo feels packaging can and should play a large role in extending product shelflife. “Even by extending a product’s shelflife by a matter of days, it would have a huge impact on the amount of waste that is generated overall,” explains Giglio. “Even with all the studies that show how packaging has provided a positive impact on our food stream there is still an emphasis to reduce what we can on our side as manufactures,” he continues. 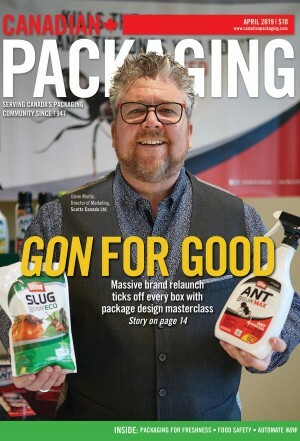 “Committees like PAC NEXT have provided a platform for companies like Tempo Plastics to come to the table with all of the players such as regional MRF (material recovery facility) operators, Stewardship Ontario and brand owners to discuss solutions to the residual of our products,” Giglio notes. “This collaboration is still in the early stages but over the past year there have been some great insights to what the rest of the world is doing about its packaging waste and Ontario is actually a leader in North America when it comes to its recycling programs. 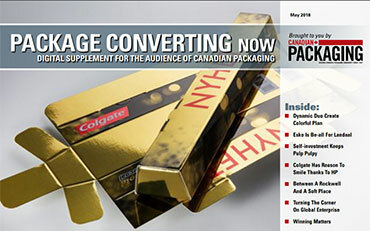 “Flexible packaging is the fastest growing pack- aging segment and dealing with multilayer laminates is a challenge that has many potential answers,” he says. “The good news is every product that Tempo Plastics makes is fully recyclable. The problem is figuring out the best solution to dealing with contaminated post consumer waste. “Educating the public will be key in developing an understanding as to how to properly recycle flexibles whether it be curb side pick up or return to depot programs we are just happy that progress is being made in making solutions for our products,” Giglio sums up. “And while I think we are on the correct path, the future looks bright to see how we can improve upon ourselves even more.